Let's start with a bit of history. Believe it or not, we never really thought we'd be having this conversation in 2016. We thought banner ads had passed their prime and would no longer be an effective marketing tool in today's world. When they started, however, the outlook was much more optimistic. It took years for the lowly 468x60 banner ad to start taking off, and once it did, ad agencies never looked back. They loved the flexibility and control the emerging technologies of companies such as DoubleClick (now owned by Google) provided them. Agencies were able to monitor and analyze a banner ad campaign's performance all in one well-summarized screen, changing the creative on the fly, testing various creative (also known as A/B testing) to see which ones performed best, and paying publishers only on what they measured in terms of impressions and click-throughs, not what the publisher measured and reported from their own analytics. This was all a 'dream come true' compared to how they had been doing business with print, television and radio in the past, and as the banner ad evolved into larger and more adaptable ad sizes (728x90, 300x250 and 160x600 pixel ad units, GIF, JPG or PNG), as well as more powerfully creative rich media (Flash, HTML5, video, etc. ), it become the standard for online ad campaigns and is still the standard now. Some things changed along the way, however. With new websites coming online every day, and the banner ad becoming such a ubiquitous and easy-to-place ad unit, the banner ad world became a commodity. Online web surfers pretended they weren't there, didn't click on them much, and their targeting capabilities were basic, primarily matching a target demographic to a website's average demographic based on region, age, theme, etc. That means an ad agency typically developed relationships with just those media companies with the largest network of banner ads, to minimize some of the effort in placing a multitude of ads. Smaller online media companies, shut out from most ad agencies, typically worked with smaller businesses or agencies looking for a very specific and targeted demographic that only the smaller website could provide. Along the way, banner ads became a commodity, priced at around $1-2 CPM on most banner ad networks and not providing any media company the real revenues they needed to earn to survive. The only ones making decent revenue in online advertising were those media companies selling banner ads in-house, with a dedicated sales team helping the advertiser to place their ads in just the right sections of a website. These media companies could command $10-15 CPM, and in the LGBT media world, companies such as Gay.com, Advocate.com, InstinctMagazine.com were doing just that, while ensuring they had high quality content to keep their online audience coming back. Fast forward to today, and you can better appreciate how the online advertising market has evolved over the last few years. Due primarily to the technology of programmatic ad buying and real-time ad bidding, websites large and medium-sized (not small just yet) are able to place their banner ad inventory on the programmatic ad exchange and make real revenues on the banner ads placed on their sites. They are also better able to compete with the larger media companies and the larger website networks that caught the attention of ad agencies in years past. These CPM rates are no longer "remnant" ad inventory, which was the case back when these types of banner ad network ads yielded around $1-2 CPM. Today, programmatic advertising is typically positioned just below a media company's in-house ad sales department. The ad banner flow typically starts with an ad server looking to place an in-house ad, sold at a premium CPM. If it can serve an ad, great, but if not, it then looks next to the 1st tier programmatic ad placement, which is typically a $5 Net CPM programmatic ad. If there is an ad to place from this 1st tier, it places the ad, but if not, it then looks to a 2nd tier programmatic ad network and so on down the line. This is what is known in today's programmatic ad lingo as the "waterfall", starting with an in-house premium ad, then a 1st tier programmatic ad placement and ending with a sponsorship ad or 'freebie' the publisher may have promised to a business partner or a charity. And did we mention inventory? The agencies have LOTS of LGBT banner ad placements to choose from... there are several million LGBT banner ad placements available today on the programmatic ad exchange, including Towleroad.com, GayStarNews.com, Gay.com, InstinctMagazine.com and more. We haven't even discussed mobile advertising yet, with the millions upon millions of well-performing ad units available on Grindr, Scruff, Growlr, Jack'd and more. Let's Talk About Yield and How Much Revenue Your Site Can Earn - From an LGBT online media publisher perspective, this is probably the most important overall concept in terms of maximizing online revenue from banner ad placements. In this instance, it's all about banner ad impressions. 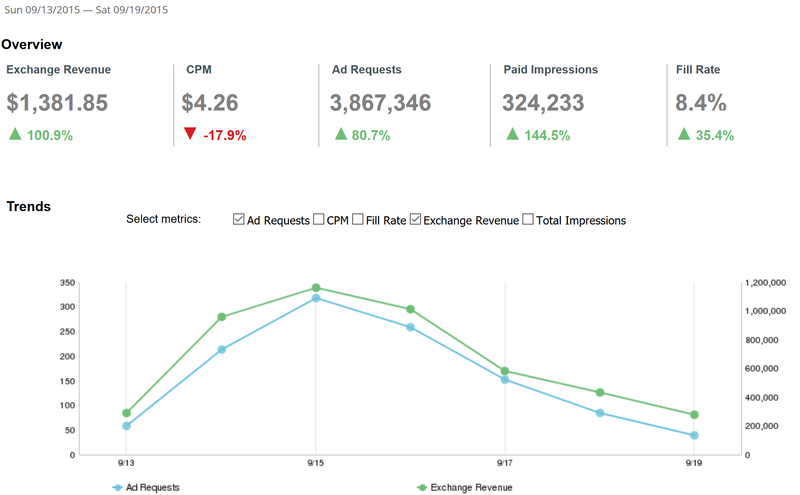 Let's use some typical website performance statistics and ad rates here. If your site receives 1,000 visitors per day, that's 30,000 visitors in one month. If one visitor typically views 10 pages on your website, that's 300,000 page views per month. If each page typically has 5 ad units on it, including one at the top and bottom of your site and 3 in the content or on the side, that's 1,500,000 ad impressions your site can deliver in one month. If you were able to sell 100% of your banner ad inventory at $5 CPM, that would be $5 for every thousand banner ads served - $5 x 1,500,000/1000 = $7,500. That's the reason you want to earn revenue for every banner ad you deliver... you may sell some premium, top placement ads in-house for $10-15 CPM or more, but that would balance out with those lower-tier network ads being placed for $1-2 CPM (which are hopefully less than 10% of all of your banner ads served). We performed a variety of tests, ensuring all variables except for CPM rate remained the same... we then adjusted the CPM rate to $4, 5 and $6 CPM for programmatic ad placements on tested sites and let it run for a week. 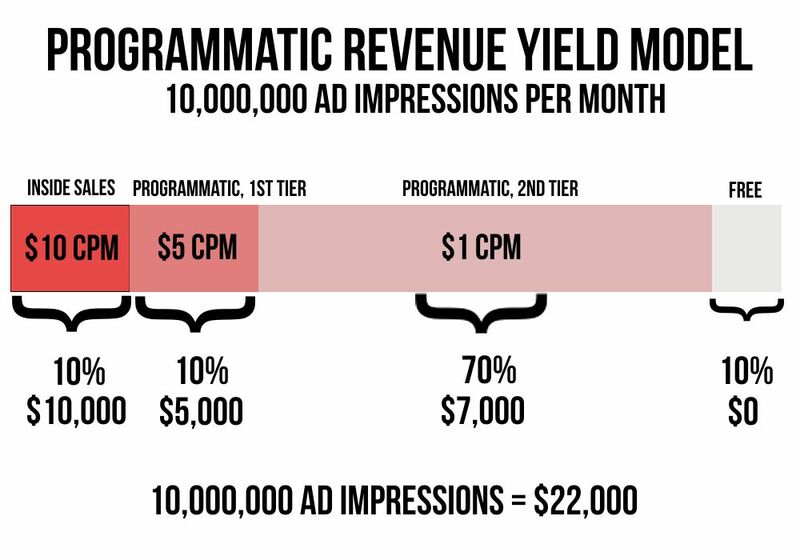 We found that the number of ads placed at the lower CPM rate did grow slightly (which makes sense... less expensive CPM rates equals a wider pool of ads that the site can attract), but the overall revenue amount remained the same. The percentage of ads a programmatic ad placement can fulfill is called a "Fill Rate". At $4, 5 and 6 CPM, the fill rates were 8, 7 and 6%, respectively. Revenue amounts remained close to the same. Thus, for our scenario, selling banner ad inventory on the programmatic ad exchange at $6 CPM makes sense. 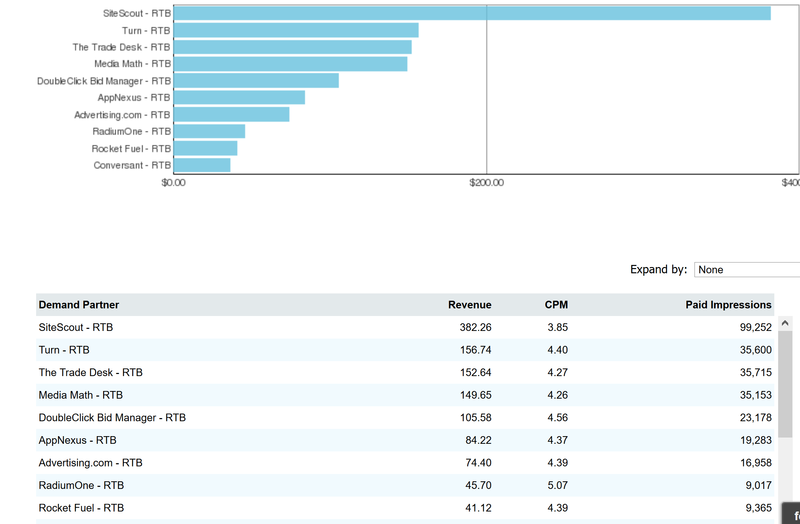 What is important is where it fits into the overall revenue mix. For a large site, a typical scenario would look like what is seen below. For a smaller site, the yield percentages go up dramatically, as there are only a fixed number of banner ads available in the LGBT world, and a smaller site's percentage of ads dedicated to this fixed amount will inherently go up. Some programmatic ad exchanges are able to combine the 1st and 2nd tiers into a series of "price bands." 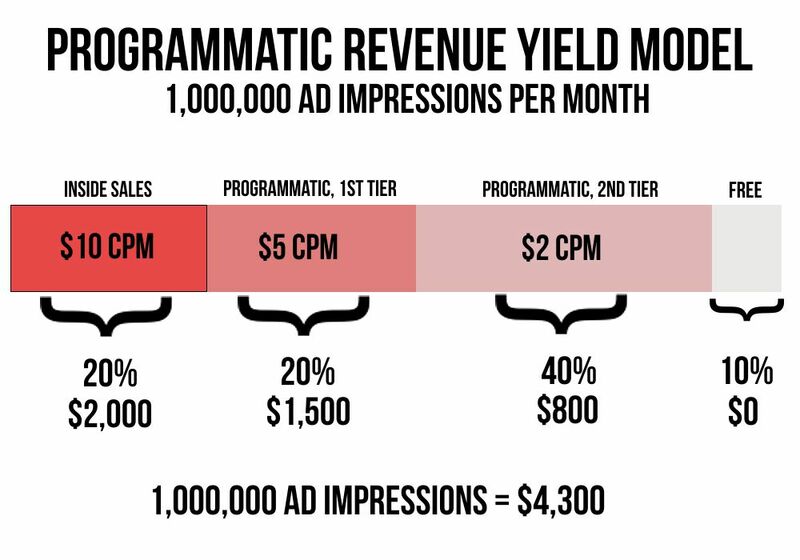 Using rather complex algorithms, they're able to completely manage the revenue maximization curve across all CPM price points, as seen in the chart below. Lastly, never underestimate the power of retargeting ad campaigns on the programmatic ad exchange, with companies such as Amazon targeting THEIR customers on YOUR site... the CPM rates on these are high, as they are considered high-quality, pre-qualified leads. This is all added revenue in your pocket. Understanding where your company lies on the yield charts above, and adjusting accordingly to maximize revenue, can make a pretty significant difference in an LGBT media company's bottom line. Is Your Site Set Up to Maximize Your Banner Ad Inventory? If your website is a professionally designed website, with IAB standard ad units cleanly displayed and above the fold, and reaching 1,000 or more visitors per day, then programmatic may be an option for you. Original, high-quality content websites command the best CPM rates and performance, with dating and directory websites coming in a bit lower on the CPM rates and typically performing with a lower click-through ratio (CTR) for the ads served. Content aggregators highlighting other source's content receive the lowest CPM rates, and as a side note, do not often index well in search engines such as Google or Bing. The most common ad sizes are the 728x90, 300x250 and 160x600 pixel ad units, while 970x250, 300x600 and 300x1050 are making headway. Should You Be On the Programmatic Ad Exchange? From everything we've described above, you can get a pretty good sense of the advertising marketplace in today's world. Ad agencies are quite happy placing their banner ads targeting an LGBT demographic on the programmatic ad exchange, and they don't need you "specifically" in order to achieve this. 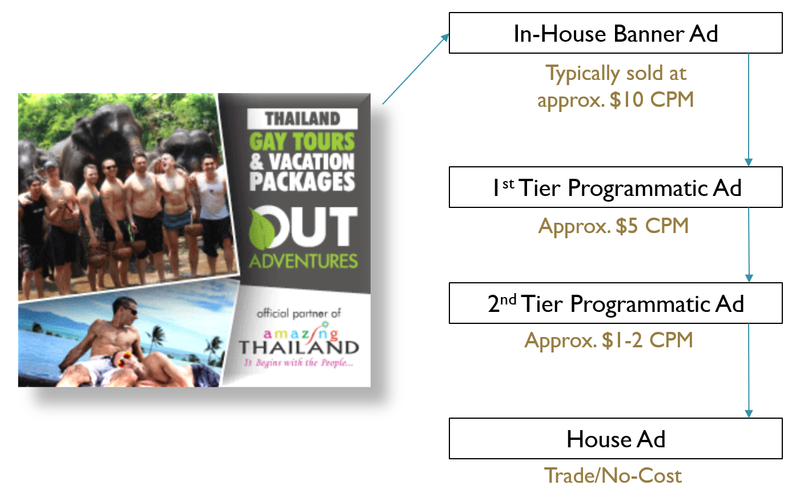 If they want to target an LGBT audience in a specific region, who might be interested in travel, or shopping for insurance, or looking to buy a home... they can target all of this and much more using the programmatic ad buying tools and inventory available to them today. Bottom line is that, unless they want more than just banner ads (see next section below), they have everything they need to target this demographic already. If your media company's website qualifies in terms of its professional quality, reach and ad placements, then being on the programmatic ad exchange means your ad inventory is now available to these ad buyers at a decent CPM rate. It also means that when they are researching LGBT media sites on the programmatic ad exchange, if your ads stand out performance-wise, they may just contact you directly to explore what else they can do in terms of advertising on your site. If your site qualifies for the programmatic ad exchange and you're interested in being a part of it, let us know. Partnering with OpenX, ADTECH Marketplace by AOL, Rubicon and Centro, we have developed an LGBT ad network on the programmatic ad exchange, and as part of it, your site would be listed on its own, with this listing managed by us. Are You Maximizing Your Media Company's Opportunities to Advertisers? This is the fun part... if an ad agency or company is able to manage most, if not all, of their LGBT banner ad media placements on programmatic, then what they need more from you now than ever before is the custom, 360-degree multimedia opportunities they can't get on programmatic ad buying. We're finding more and more LGBT media proposals focusing on content first, helping the advertiser to get the word out, both in print and online. From this content-first approach, a broader campaign can be developed to get this story out to your viewers and members via e-mail, as well as Facebook, Twitter, Google Plus, Tumblr, LinkedIn and more. Sometimes the banner ad portion of this kind of ad buy becomes the "value-added" component to a much larger, more comprehensive plan designed to help advertisers in achieving their goal of reaching the LGBT community with their product or service. Are You Maximizing Your Sales Force and Leveraging Their Client Relationships to Their Full Potential? Even in today's world of smartphones, social media, texting and e-mail, the personal relationship still reigns supreme. 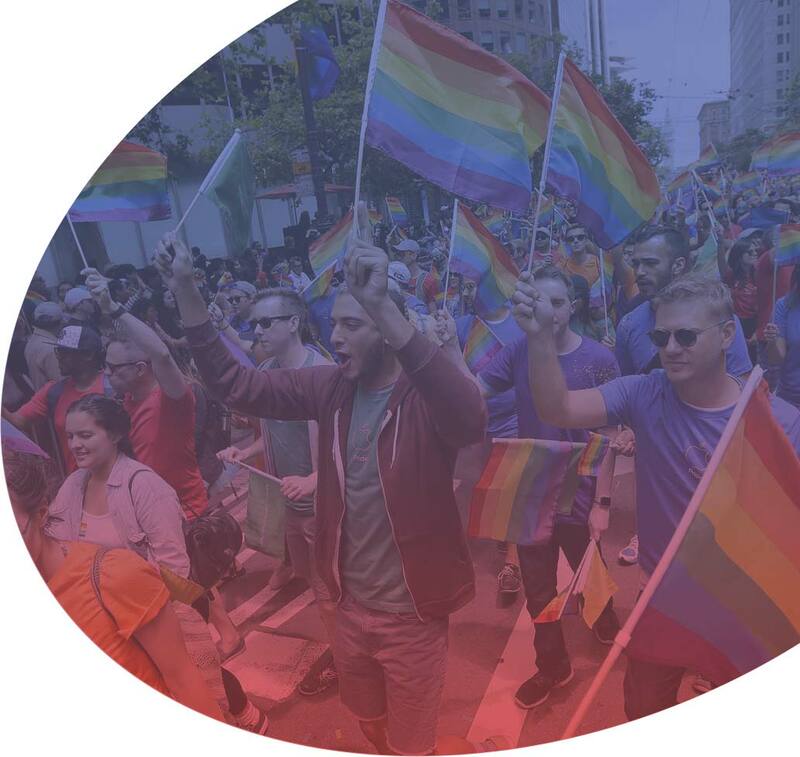 Your strongest and closest clients have a personal relationship with your company and your team, and often would prefer to work with them in reaching an even wider slice of the LGBT target demographic your media company provides them. We can help. Having access to millions of LGBT banner ad impressions, both for desktop and mobile smartphones, we can help your sales team by putting together a joint proposal targeting this LGBT demographic on your behalf. For example, if your client is seeking gay men in Washington, DC, we can reach them by specific neighborhoods in DC via LGBT mobile apps, as well as geo-targeted ads on websites including GayStarNews.com, InstinctMagazine.com, Gay.com, Towleroad.com and more. We would work with your company on a 15% commission basis for these opportunities. 1st Party LGBT Data - this is a term used to describe the following scenario. An individual visits your site online and is, from that point on, identified as a visitor to your site via a browser cookie, as well as other more advanced tracking methods. This collection of users visiting your site becomes a "data point" in the world of programmatic ad buying, and in this case, it's called "1st party LGBT data". We can then work with both you and your sales team, as well as potential advertisers that are looking to target your website's audience but from a broader perspective. Any of your site visitors tagged with this 1st party LGBT data point can be served an ad on any other website they visit that's part of the programmatic ad exchange. Serving them this ad is called "retargeting" or "remarketing." Targeting them with an ad that is either sold by your sales team or ours is basically allowing you to increase your website's overall audience you're able to reach, placing ads on sites that are OUTSIDE of your own. It also opens up the revenue opportunities for your sales team. Lastly, if you had something you wanted to promote specifically for your own company or one of your sponsors or partners, you could run retargeted ads on this network of yours for as low as $3-5 CPM. Is Your Site Mobile-Optimized? We're not going to get into all of the details here... that would be a lot of ground to cover. We all pretty much know that more and more of the traffic coming to our respective websites is mobile, viewed on a smartphone or tablet. Optimizing this experience so that the mobile user can easily view and navigate your website is becoming more of a priority in today's world. From our perspective, the important topic here is the mobile ad unit, the 320x50. You'll want to ensure that this is part of your mobile-optimized website design, as these ad units are becoming more and more popular with advertisers and an obvious source of additional income for media companies large and small.